One confidante - longtime friend and former executive chairman of his inaugural committee, Tom Barrack - was approached to gauge his interest in the chief of staff position, a source familiar with the matter told ABC News. Barrack said he won't take the job, the source said. While Kelly's fate is in question, sources familiar with the matter said they did not believe his departure is imminent. Kelly was seen working in the West Wing on Friday, leading his daily senior staff meeting and joining Trump in the Oval Office during an afternoon photo op. Kelly faced criticism earlier this week over comments labeling undocumented immigrants brought to the U.S. as children as "lazy," and received a public rebuke from President Trump after saying in an interview last month with Fox News that the president's campaign promises regarding a wall along the U.S.-Mexico border were "uninformed." But it was Kelly's management of the most recent controversy involving Staff Secretary Porter that ignited a firestorm, after the Daily Mail published multiple allegations of domestic abuse by his two ex-wives. 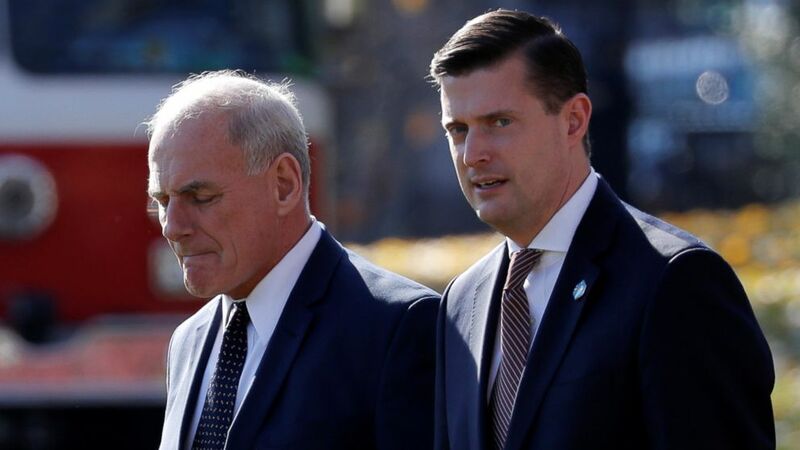 In response to the story, Kelly issued an on-record statement calling Porter "a man of true integrity and honor" but making no mention of the alleged victims. Under pressure, Porter offered his resignation Wednesday afternoon. It wasn't until late that evening, and after images of the alleged abuse were revealed, that Kelly issued a new statement saying he was "shocked by the new allegations," adding "there is no place for domestic violence in our society." ABC News reported that senior members of Trump's administration knew for months that there was a personal issues haunting Porter, according to multiple sources - raising questions among staffers about why he was allowed to continue in such a prominent role in the West Wing. Deputy Press Secretary Raj Shah said Thursday that Kelly did not have "detailed updates about what may or may not have been alleged."